Our society is tumultuous right now. I’ve been conversing with a lot of clients, colleagues, and friends who share my distress about the fever-pitch levels of discord, disharmony, hatred, suspicion, and negativity that are swirling through our communities right now. In the middle of such painful uncertainty, I’m touched and inspired by the fact that so many people I know are refusing to succumb to the paralysis-inducing fear that this kind of societal negativity naturally evokes. They march, make phone calls, host postcard-writing parties, offer aid to immigrants, facilitate healing, examine their own biases, and lead idea-generating discussion groups. Yet even though societal strife is pushing us to play a more active role in our communities, being engaged in this way is new to many. It takes a while to discover or create opportunities for contributing our energy to the wider society in a sustainable way. And even when we’ve found a project or a cause to pour our life energy into, we can still feel kind of anxious when we wake up each day to the turmoil that surrounds us, aching to do something to make a difference. That is, our brains contain resonance circuits that cause interpersonal experiences to directly influence how we mentally construct reality! Just how does that idea bring me solace in these troubled times? That knowledge about the social wiring of our minds makes me understand at a visceral level that I can make a difference in the larger societal mind with every social interaction I engage in. That is, I instigate ripples of kindness and respect in my broader community each time I treat another person, place, or animal with understanding and positive regard. This nugget of knowledge has inspired me to make a daily practice of “setting my heart right” as part of my contribution to healing the wider world. I use Confucius’ idea of setting my heart right to bring active and mindful awareness to making my kind feelings toward others more visible: I make eye contact with the checker at the convenience store; I hold the door open for another person even when I’m in a hurry; I hug my friends when I greet them; I nod at the homeless veteran stooped on the corner even when I don’t have money to give. The opportunities are endless. I know I made a difference to her that day, just by acknowledging her humanity with small talk. And the way she received my momentary kindness touched me to the root of my soul. My heart swells and I cry every time I recall her open and grateful face, even now while I’m writing this. Remembering that simple yet life-altering moment of human connection makes it easy for me to understand that setting my heart right, and mindfully attending to the emotional signals I broadcast in everyday moments of my life does have an impact on my community. We really don’t have to wait to find our perfect cause to take action to heal our world. We can mindfully turn our loving gaze out onto our anguished world in small moments. Right now. Today. And our kindness will ripple out into the interpersonal mind in ways we are too small to predict. 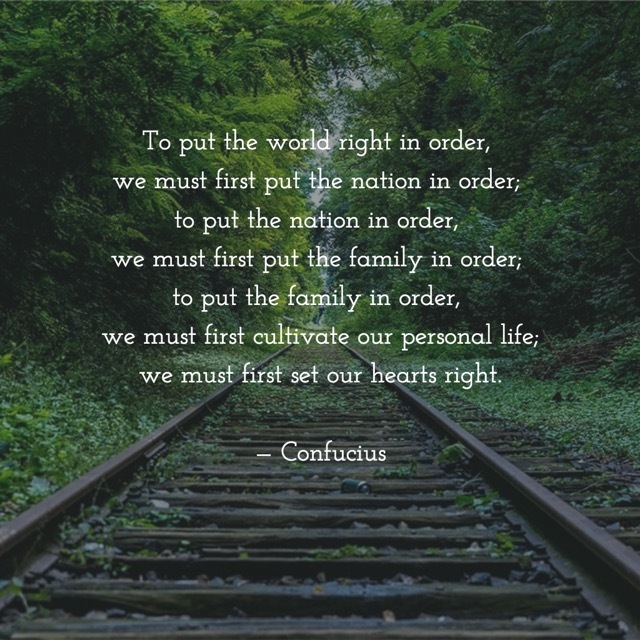 How can you “set your heart right” at the beginning of each day? What small gestures of kindness and respect can you imagine offering to strangers and loved ones? What gets in the way of your mindful, loving gaze out into the world?